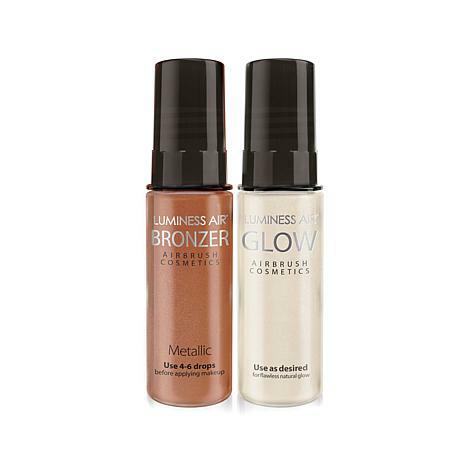 Pair this bronzer and highlighter duo with your Luminess airbrush makeup system for a flawless, contoured look. 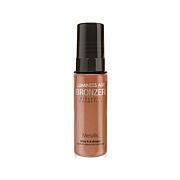 Get a sun-kissed glow, shade in those cheekbones and add a dewy, candlelit radiance to the high points of your face. It's a professional look made available right in your own home. 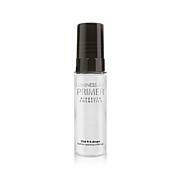 Shake makeup for 60 seconds before first application. Ingredients: Purified water, (aqua), Glycerin, Acrylates Octylacrylamine, Copolymer, Magnesium Aluminum Silicate, Butylene glycol, Xanthan Gum, Potassium, Sorbate, Disodium EDTA, Triethanolamine, Propylene Glycol (and) Iodopropynyl, Butylcarbamate (and) Diazolidinyl Urea, Propylene Glycol (and) Azadirachta Indica, (Neem) Extract, Potassium Olivoyl PCA, Lecithin, Kaolin, Titanium Dioxide, Stearic Acid, Cetearyl Alcohol (and) Glycerin Stearate, (and) PEG-40 Stearate (and) Ceteareth-20, Ascorbyl Palmitate, Phenoxyethanol, Tocopheryl Acetate, Mica (and) Titanium Dioxide, Iron Oxide (CI 77891, CI 77492, CI 77491, CI 77499). Ingredients: Purified Water, Glycerin, Potassium Olivoil PCA, Stearic Acid, Phenoxyethanol, Triethanolamine, Glyceryl Stearate, PEG-100 Stearate, Tocopheryl Acetate, Potassium Sorbate, Disodium EDTA, Lecithin, Kaolin, Chlorphenesin, Silk Protein, May Contain:Mica,Titanium Dioxide, Iron Oxides,D&C Red 30.